Free plugins on Black Friday have become part of music technology folklore, so we’re pleased to see that Waves is keeping up the tradition by letting you download Sibilance, a vocal de-esser, for nothing. Despite its freebie status, this is said to be capable of removing harsh ‘s’ sounds “faster than ever before, with exceptional quality”. It’s powered by Waves’ Organic ReSynthesis engine, which promises precise identification of unwanted sibilant sounds so you can enjoy smooth, glitch-free de-essing and a brighter vocal sound. Organic ReSynthesis uses spectral filters, and is designed to separate the sibilance from the rest of the vocal signal, which is untouched during processing. It’s easy to set up, too: stick it on a vocal track, set the threshold and range controls to taste and you’re good to go. 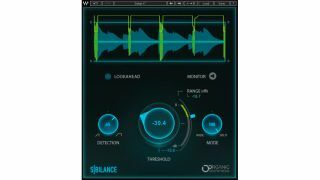 You can download the Sibilance plugin for free on the Waves website, and this isn’t the company’s only Black Friday promotion. There are also massive discounts on many of its products, and if you spend $50 you’ll get one plugin, up to a value of $29, for free. If you spend $100 and you’ll get two $29 plugins for free, so if you’ve been waiting to stock up on Waves products, now’s the time to do it.